Like so many of those who keep making the choice to deal with the complication and expense of living in New York City, Tatiana and I are huge fans of its culture, idiosyncrasies, and history. 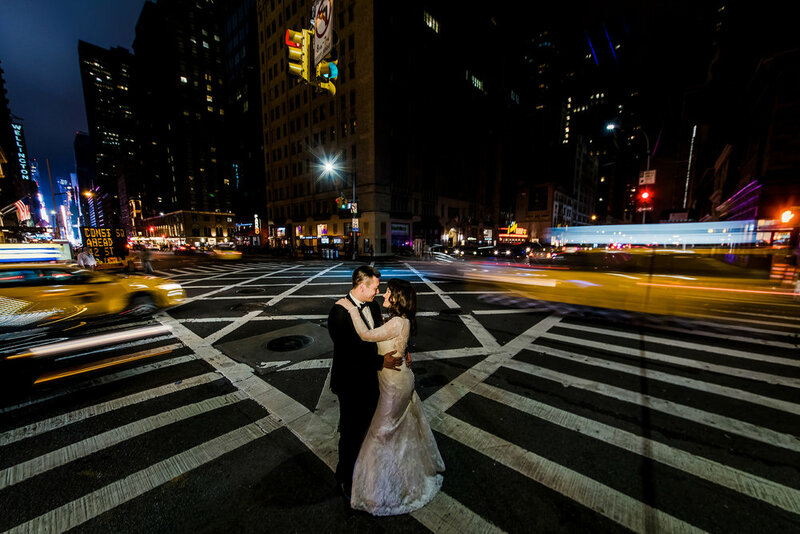 So we were excited at the outset when Adriana and Stephen came to us with their wedding in New York's iconic Russian Tea Room, which has connections to Adriana's family. Of course, most excitement came from Adriana and Stephen themselves, and how fun they were to work with. We asked Adriana what was most important to her while planning the wedding, and … well, we have to swear this isn't a paid advertisement: "Booking our photographers!" You see, Stephen wanted to become a wedding photographer himself in part from seeing our work, which is one of the biggest compliments we could possibly get. Adriana reached out to us the day after they got engaged, and kept it as a surprise to Stephen for a while. "I wasn't above planning our wedding around your schedule - anything to lock you in!" As avid photographers themselves, it might not be a surprise that the photos were one of their favorite parts. When planning weddings, we know that the thought of mid-reception photos isn't for everyone, since it takes a few minutes away from valuable action, but for some couples it's a perfect time to actually get to see and talk to your new partner amidst all the chaos. "It was so wonderful to just be able to steal a moment away and go off without anyone knowing where we went (or realizing we were gone) so we could enjoy some time alone and take more photos." She also fondly remembers her brothers -- Ken, who officiated, and Adam, who "sobbing like a baby during my dance with my dad - it was super sweet." Family appears prominently in their memories. Stephen remembers Adriana's sister having a brief but "extremely intense" show of emotion at the wedding. "(She's not one to ever really show emotion - so it was amazing!)"